House talk: Speaker Wade Mark, centre, takes in an exchange between Government Chief Whip Dr Roodal Moonilal, left, and Opposition Leader Dr Keith Rowley during a sitting of the Lower House earlier this year. The new parliamentary session begins on Friday with a ceremonial opening at Tower D of the Port-of-Spain International Waterfront Centre at 1.30 pm. The opening will be significant, primarily for three reasons. 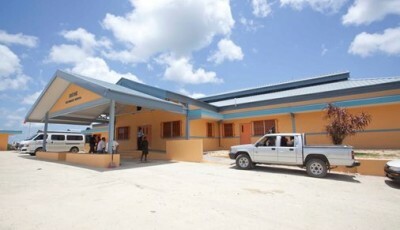 The first reason is this will be the second ceremonial opening of the Parliament at Tower D, since Parliament was relocated from the Red House in 2011 to facilitate its upgrade. The second reason, is this will be the first time that President Anthony Carmona will deliver an address to a joint sitting of the House and Senate, since his election as President in March. Carmona’s predecessor, Professor George Maxwell Richards, usually spoke on a topic of his choice at these openings rather than delivering a throne speech, which outlines the Government’s legislative agenda. 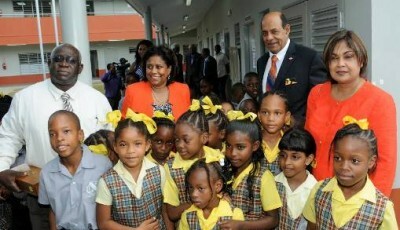 Sources said Carmona is likely to determine the topic he will address to parliamentarians. Thirdly, the MP elected today for Chaguanas West is expected take the oath of office on Friday. Former MP Jack Warner, the United National Congress(UNC) Khadijah Ameen, the People’s National Movement’s (PNM) Avinash Singh, Dr Kirk Meighoo of the Democratic National Assembly and Oliver Norman of the National Coalition for Transformation (NCT) are the candidates in the bye-election. 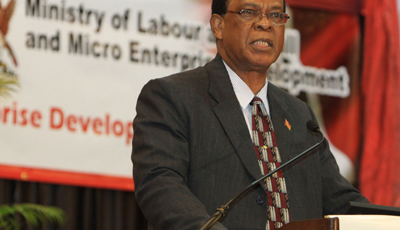 While attention will be on Chaguanas West, eyes will also be on the San Fernando East constituency whose MP Patrick Manning has been absent from the last session as he continued to recuperate from a stroke he suffered last January. The former prime minister was granted several periods of leave by Speaker Wade Mark during the last session. Depending on the outcome of today’s bye-election, sources said there is the possibility that Prime Minister Kamla Persad-Bissessar could announce the date for local government elections on Friday. Persad-Bissessar, who is also UNC political leader, has said the UNC would negotiate allocation of local government seats with the Congress of the People (COP) after the bye- election. She said local government elections will be called before October 26 and has also hinted that general elections could be called before the next two years are up. 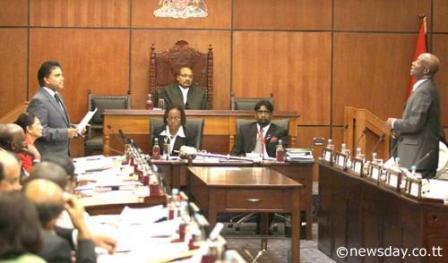 General elections are constitutionally due in TT in 2015. After Friday’s opening, the next major parliamentary event will be the presentation of the 2014 Budget by Finance and Economy Minister Larry Howai. The budget must be passed by both the House and the Senate before October 31. There is a possibility the Budget could be presented in August or September and be followed by Local Government Elections. Another option could be to hold local government elections before the Budget. Out of a total of 26 bills which Government brought to Parliament in the last parliamentary session, it succeeded in getting seven of them passed in the House of Representatives and the Senate, before the session was prorogued on July 10. These seven bills, were also assented to by the President. 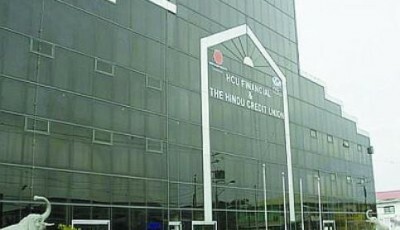 They include the Administration of Justice (Indictable Proceedings) Amendment Bill 2012 ( from which the Section 34 controversy arose); Appropriation Bill 2012; Finance Bill 2013; Financial Intelligence Unit of TT and Anti- Terrorism Bill 2012; Motor Vehicles and Road Traffic (Amendment) Bill 2013 and the University of the Southern Caribbean (Incorporation) Bill 2012. A total of nine pieces of legislation lapsed during the last parliamentary session. Notably among these bills were the Constitution (Amendment) (Tobago) Bill 2013 and the Defence and Police Complaints Bill 2013. The former bill was piloted by the Prime Minister in the House on January 16, five days before to the Tobago House of Assembly (THA) elections on January 21, which the PNM won taking all 12 seats. The debate never resumed on this bill. The Defence and Police Complaints Bill 2013 was designed to grant police powers to members of the Defence Force. While the bill was passed in the House on March 15 by a margin of 29 to 11, the Government failed to get the necessary support to pass this bill in the Senate. The bill needed a three fifths majority for passage in the House (25 votes) and in the Senate (19 votes). Six of the nine Independent senators and all six Opposition senators refused to support this bill when it was debated in the Upper House of Parliament on April 2, 3 and 23. The Dog Control Bill was the final piece of legislation which the Parliament dealt with prior to its prorogation on July 10. The bill was passed in the House on July 3 and passed in the Senate on July 10. However Attorney General Anand Ramlogan, gave a commitment to senators, the bill would not be sent to the President for assent until amendments to the bill are discussed and approved.